Although the maker of the second quilt is unknown, the story it tells reveals a family's grief at the loss of two young daughters. The rare appliqued and pieced cotton, flannel and velvet memorial quilt was done in the Baltimore Album tradition around 1900-1910, in which individual panels are arranged in a narrative sequence to tell a story. This quilt illustrates the events in the life of one African-American family with symbolism and colors from their African heritage. The story the quilt tells is the loss of two young sisters who perished in an epidemic that hit Baltimore at the turn of the century. 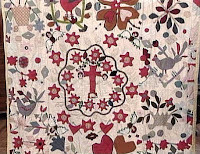 The woman who made the Baltimore quilt was a skilled seamstress who expressed her sorrow over the girls' death through the fine stitches in this exemplary quilt. She did this with her adept handling of needle and thread, and by including distinct African design motifs in her composition. The vibrancy and range of bright colors in the floral applique belies the sadness felt over the girls' deaths. Throughout the quilt are bright whites, suggesting the African world of the ancestors, and vivid reds, representing the Shango cult of the Yoruba people.